Sunday morning wasn't too early a start... My alarm was set for the same time as it would be if I wanted to go out for an early sunrise ride, 7am. I arrived at the yard around 8.15am with only needing to feed, plait, do a bit of stain removing and give Louie a good overall brush. It makes a big difference having Andrew on hand so I don't have to think about getting the horsebox packed and sorted, plus he even gave me a hand plaiting, passing me the spray, brush and bands. We left right on time - 9.40am. My dressage time wasn't until 1.05pm, so I needed to be in the warm up by 12.30pm. When travelling a bit further, I like to give Louie some chill time when we arrive, rather than just arriving to tack up and get on, so I was aiming to be there for 11.30am. The weather was AWFUL! While it was blue sky and bright sunshine, the wind was SO strong - BBC's weather app was showing in between 45 & 50 mph! Fortunately, our little box is pretty sturdy - very different from driving a trailer with an independent moving back half and doesn't catch the wind in the same was a bigger horseboxes. However, it did mean that we needed to travel a little slower than usual so I'd left the yard a little earlier than I usually would. 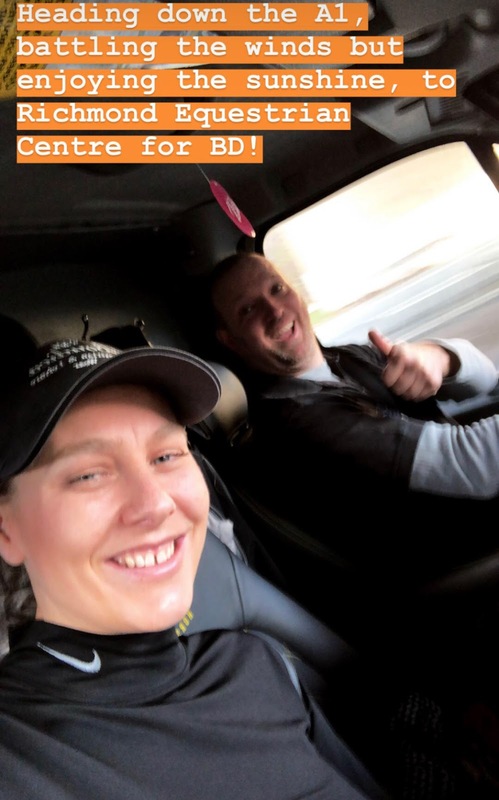 We arrived in really good time - 11.15am - so we had plenty of time to go grab a coffee, see what what happening, figure out my arenas and warm up, and take some down time in the horsebox. All that would have been MUCH easier and quicker had it not felt like we were walking across the Artic! However, I was super relieved that we were warming up and competing in the indoor... It wasn't particularly warmer but at least we weren't in that awful wind! There is something about warming up in the wind that really puts me off. I'm not sure whether it's because I can't gauge my forwardness and pace, or whether it gets me off balance, or what it is that bothers me, but something does that just doesn't affect me at home!! 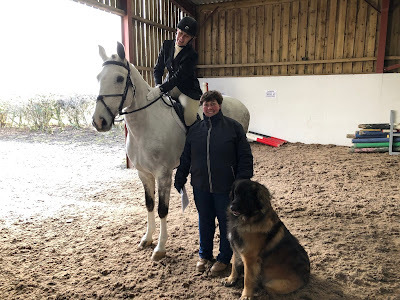 I've been having flatwork training sessions with Cathy for six years now, and this was the first time she & I were able to co-ordinate timings at a competition. It was a great opportunity for Cathy to see my warm up for what it, and from my side it was really supportive to have Cathy's input to help us improve our way of going before we headed into the test arena. She really helped me to get Louie in front of the leg, gaining plenty of energy before bringing my rhythm into check, as well as working on releasing his neck out and forward but keeping the height in the poll. It was a brilliant experience! Cathy left me to my warm up, without interfering but just adding valuable input and tips as we went around the warm up. It really sums up that warms up are not the place for learning new things, but just fine tuning what you already do at home. It was soon time to head in for our dressage test. There was lots of things I'd spotted and noted to be aware of - banners at some points around the edge of the arena, a glass fronted cafe that ran up the long side, light rays shining on the track of the arena, and plenty of "stuff" stored along the edges!! Louie went in spooky, but really a lot better than his old days of spooking. He was still responsive, and when unsure, just slowed down a bit to check it out first, which as I was cantering back towards the track, wasn't ideal. But it felt like gone are the days of taking a total deviation from our planned track or letting it upset him so much that it spoilt the upcoming three movements... That in itself is a BIG step forward, especially with my own tendency to be highly self-critical! There was lots of good points, but it wasn't our best test to date with plenty to work on while also showing that we still need to come to lots of different places to make the little spooky parts look less obvious... I don't think they will ever go completely, but that's part of who Louie is, but we can certainly work on reducing their impact. We didn't collect our scores until after our second test, mostly because we only had about 20 minutes break in between. So I chose to give Louie a session with his massage pad on while I ran through my next test a few times in my head. We had 20 minutes warm up for the second test. 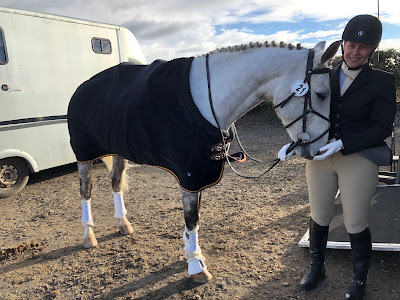 I always feel Louie doesn't have the same bounce in the second warm up and test, but this time he came out fairly consistent to his first test, so I worked on keeping him ahead of my leg and keeping his neck out in front of me and taking me through many in-pace transitions. Before we knew it, it was test time again. This time was even better... Cathy watched our test! I was thrilled as now she would see how we both performed for herself. I always send my videos to her, but it's hard to gauge the reality sometimes through a video. Louie came in more relaxed, and before the judge beeped us to start, Cathy reminded me not to chase him but encourage him to take me. I felt the difference instantly when adapting, but I just wish I could remember it throughout my test! After a bit of a cool down and finding a chance for a team photo... Just Andrew missing, but then he doubles up as groom and photographer, as well as many more things! 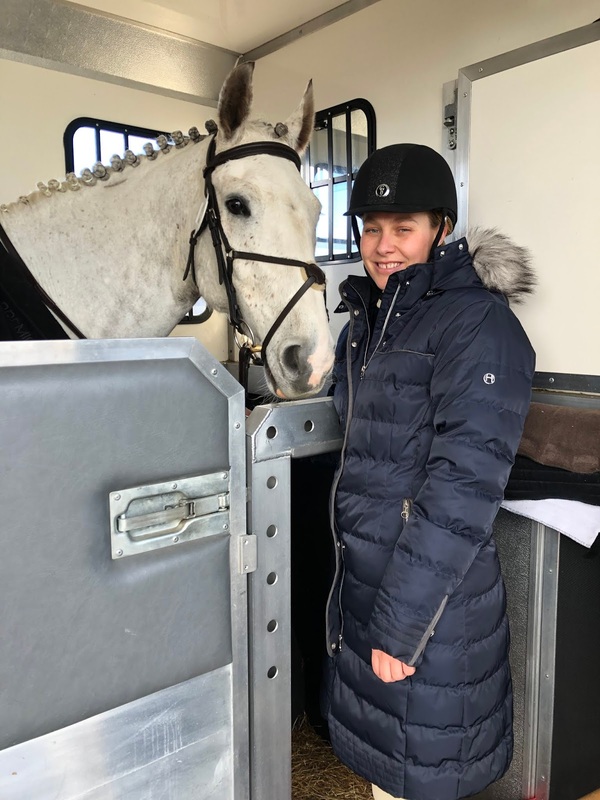 We headed back to the horsebox and got Louie stripped down in record timing, and changed to his massage pad again with super cosy fleece cooler on. Fortunately, it was so cold, Louie didn't even have sweat marks on his girth so no cold water washes, except for up around his little fluffy ears! 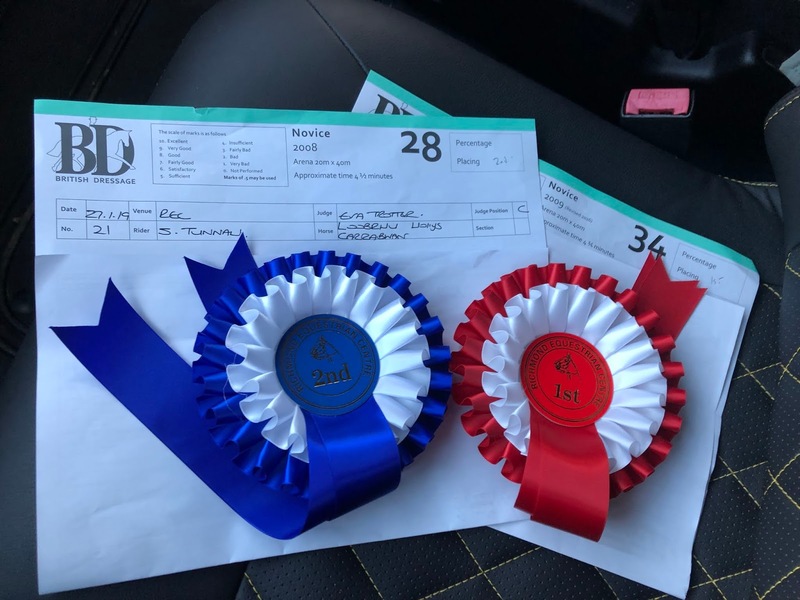 We headed over to the scoreboard where both classes had now finished so we were able to collect our test sheets and saw lovely two ribbons sitting there for us! I was delighted to see we'd come second in our first test on 66.8% in the Bronze section & just 1% behind the overall winner. Our second test was pleasing but scored slightly lower and lower in contrast to the overall class - we scored 64.5% which won the Bronze section. I've always felt that north Yorkshire is a fairly competitive area, so to score and be placed like this is something I'm really quite proud of!! 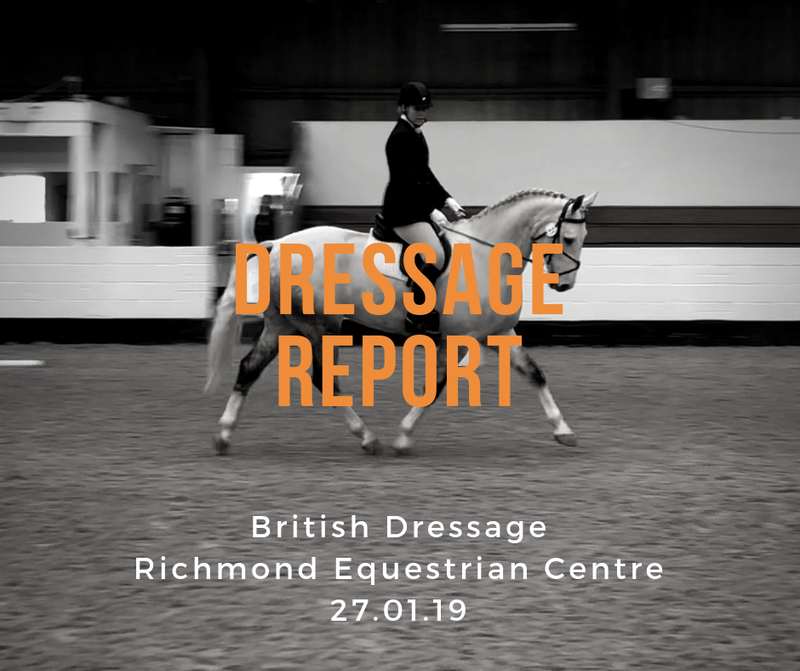 It also another seven points towards our British Dressage qualifications. Over the coming few months, I really want to start achieving higher scores to hit the Summer/Regional qualifying points barrier which is 67% - I'd need to get 19 points in the qualification period with 10 of those points being in qualifying classes. Only points from scores of 67%+ count. Once I am achieving that, I will step into the Silver section so that I can gain qualification. There is no Novice Bronze section for Winter/Summer Regionals; instead PetPlan Area Festivals caters for this level. I'm impressed at how much you have gotten out already this year! Great start to the year.